Located in Cockeysville, Maryland, A&A Global Industries is the leading manufacturer and supplier of bulk vending machines and product in the world. Founded in 1938, the business has grown from a small, local machine manufacturing company to a worldwide enterprise producing and stocking coin-operated vending machines. As a leader in their field, A&A Global management is constantly looking for ways to profitably grow their business. Based on the amount of electricity needed to operate the vast amount of equipment at their facility, key decision makers understood the rapidly rising cost of electricity was going to adversely impact their business, and they began to consider ways to address, landing on solar as the best way to reduce the cost of their utility-provided electricity. In addition to the significant financial savings, which are expected to be well over $8 million over the useful life of the solar array (! ), this project represents an important accomplishment in A&A’s ongoing environment and sustainability efforts. 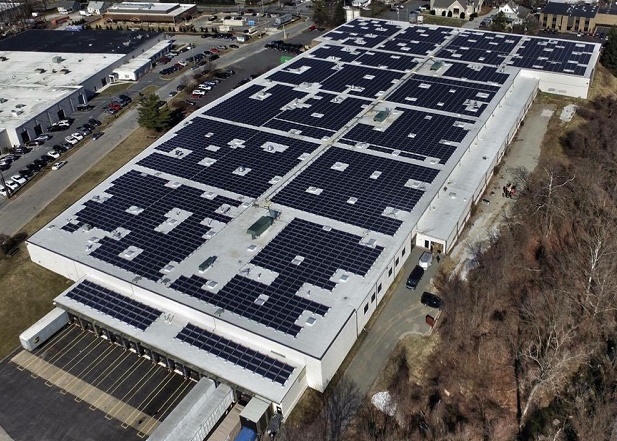 The solar system is installed at A&A’s corporate headquarters which houses a fully-operational manufacturing facility as well as a large warehouse. The “clean power” produced by the 1,600 kW solar system will reduce A&A’s carbon footprint by the equivalent of planting 31,975 acres of trees. The owners of A&A Global are very happy with their decision to install solar. Plans are in place to take a closer look at two other A&A facilities for the possibility of installing solar systems on these buildings as well , to continue to leverage the ‘free fuel from the sun’ in ways that align with the company’s values and provide great financial savings as well.